Your wedding is a fairytale come true, share your whimsical love with your guests on your big day with this sweetly designed Wedding Coach Serving Set. The fairytale themed cake and knife serving set feature detailed poly resin handles that depict a carriage with open heart shapes throughout and accented with brilliant rhinestones. 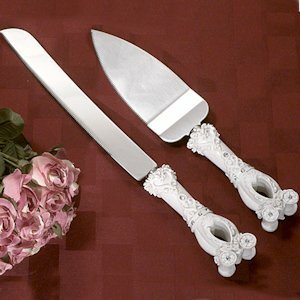 The knife measures 12.5" and the server is 10.5", both are stainless steel. The set arrives in a gift box that is perfect to use to store the pieces after your big day as a special keepsake. Search for "Wedding Coach" on our site for coordinating items to carry the fairytale theme throughout your event. Do you personalize wedding cake servings?